China's Shenzhou-11 spacecraft will transport two astronauts to the country's Tiangong-2 space lab in a few days. Experts say that this will mark the opening of a new era of Chinese space exploration. In the Oscar-winning film Gravity, the American heroine eventually returns to Earth after her space station is destroyed with the help of a Chinese spacecraft, the only one in orbit able to help her. The fiction may get closer to fact in a few years as a Chinese space station is expected to become the only one in space within a decade. China is scheduled to launch the Shenzhou-11 spacecraft within a few days, which will dock with the Tiangong-2 orbiting space lab and deposit two astronauts who will live in space for around a month, twice as long as their predecessors stayed in the Tiangong-1 station in 2013. This will be China's sixth launch of a manned spacecraft and another step toward the completion of the Tiangoing Space Station, which is scheduled to become operational in 2022. The International Space Station (ISS), which welcomed its first crew in 2000, will retire in 2028 at the latest, according to Markus Braun from the German Aerospace Center. By then China will likely be the only country that has a science lab in space. "The flight of the Shenzhou-11 and its linkup with Tiangong-2 is further evidence that China is committed to growing its human spaceflight program," commented Leonard David, a US space journalist who has been reporting on the space industry for more than five decades. "Methodical and step-by-step progress is the hallmark of China's impressive space efforts. It also underscores the value of human space exploration, not only circling the Earth, but moving forward to the Moon and Mars," David, author of a new book published by National Geographic, Mars: Our Future on the Red Planet, told the Global Times. In the eyes of James A. Lewis, senior vice president and program director at the US-based Center for Strategic and International Studies, space is also tool of diplomacy and national power. "China's successes in space also reinforce its claims to regional dominance by demonstrating that it is the most advanced Asian nation, with the technology and resources that others cannot match," he said in a report to a recent hearing at the US House of Representatives titled "Are We Losing the Space Race to China?" On September 15, during the Mid-Autumn Festival, China's second space lab, the Tiangong-2, blasted off from the Jiuquan Satellite Launch Center in Northwest China's Gansu Province. Now, circling the Earth every 90 minutes in an orbit about 393 kilometers above the planet's surface, the module is waiting for the arrival of the Shenzhou-11 and two astronauts whose names are yet to be publicly announced. The crew are planning to carry out 14 experiments on board the Tiangong-2, including some related to aerospace medicine, technology application and repair tests. According to the China Aerospace Science and Technology Corporation, the major contractor behind the spacecraft, the Tiangong-2 is much more advanced than the Tiangong-1. Many technologies used in the new craft have never been used before in a Chinese spaceship. Its domestically-developed "smart housekeeper" can automatically diagnose the craft's operation status, execute instructions remotely and find technical faults, the Beijing-based Economic Daily reported in September. Many of the ship's systems like its power supply, heating and data management are designed to be highly integrated modules which can be replaced within minutes if a failure occurs. Wireless Bluetooth communication devices will also be used for the first time. Pang Zhihao, a researcher with the China Academy of Space Technology, told China National Radio (CNR) recently that the Tiangong-2 carried less fuel upon launching than Tiangong-1 which saved room for other equipment, such as a running machine for the astronauts and a mechanical arm. The astronauts will use a total of 12 specially made materials, including a nanocomposite that can facilitate communication and a metal alloy that is exceptionally light and hard. Unlike the mission of the Tiangong-1 which focused on the docking procedure itself, the Tiangong-2 mission actually involves the application of space technology, which symbolizes the start of China's space station era, Pang said. Besides, a small adjoining satellite will be tested during the flight, which can film the docking scene with high-resolution cameras, according to CNR. In September 1992, the Chinese government decided to implement the manned space program and establish a space station on a long-term basis. In 1999, China successfully launched its first unmanned spacecraft, the Shenzhou-1. In 2003, China sent Yang Liwei - its first astronaut - to space in the Shenzhou-5. In the same year, China started its lunar probe project. In 2013, China's first moon rover Yutu or Jade Rabbit drove on the moon's surface after the world's first lunar soft landing in nearly four decades. David believes how far and how fast China has come in a relatively short period of time is "striking." "Its robotic lunar exploration projects are indeed notable," he said. In April, Lieutenant General Zhang Yulin, deputy commander of the China Manned Space Program, revealed that the country plans to send astronauts to the moon within 15 to 20 years, according to state media outlets. 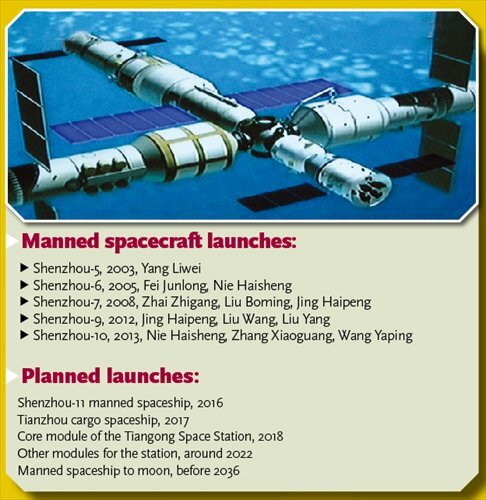 Official figures show that China has spent a total of 39 billion yuan ($5.8 billion) in total on its manned space program by the time of the launch of the Shenzhou-10 in 2013, only a seventh of what the US spent on its space program in 2013 alone, and one third of the NASA's spending in 2015. In the wake of the launch of Tiangong-2, a post was widely circulated on Chinese social media saying that China has proved its detractors wrong. "The success today is our first step for the space station. We don't brag or belittle, but I just want to say to those countries who have downplayed us: thank you for your rejection that propelled our growth that you may fear," a Sina Weibo user named "dongfeng expressman" said in a post following the successful launch of the Tiangong-2. The post received more than 44,000 reposts and 55,000 likes. China has tried to become part of the joint American, Japanese, European, Russian and Canadian ISS program but was rejected due to NASA's policy of never working with Chinese State-owned groups, so China was then forced to build its own program, the user explains. That view has been echoed by several Chinese space researchers. Yang Junhua, former secretary-general of Chinese Society of Astronautics, told the Beijing Sci-Tech Report in a 2011 article that Chinese space technology has been isolated by some Western countries such as the US. "We have been making the efforts, but haven't been given the ticket to get in the ISS," Yu Mengfan, a researcher from China Academy of Space Technology, was quoted as saying by the newspaper. It seems that the US itself will continue its isolation policy towards China. On September 27, the US Committee on Science, Space, and Technology, Subcommittee on Space held a hearing titled "Are We Losing the Space Race to China?" The witnesses expressed their worries over the progress China has made in space exploration and called for the US government to reinforce its space defences. "Maintaining the ability of the US to establish space dominance, meaning preserving our own access to space as well as denying it to an adversary, is central to that," Dean Cheng, Senior Research Fellow for Chinese Political and Security Affairs The Heritage Foundation, said in his testimony, according to science.house.gov. Li Daguang, a space expert from the People's Liberation Army National Defense University, told the Global Times that "The US has started to develop space combat readiness. China has been opposing the militarization of space, but our steady progress worries them, as they fear that Chinese outreach in space would threaten their dominance in space." In his opening statement, Texan Republican Lamar Smith, also chairman of the US House Committee on Science, Space, and Technology, said that the Obama administration's cuts to space exploration and the disruption of exploration planning "has eliminated our opportunities to return to the Moon." Meanwhile, China continues to make progress, Smith said. "We cannot resign ourselves to the remembrance of past achievements. It is time for the US to reassert its leadership." Despite the US's isolation policy, China has been opening up to other countries for mutual space technology development. During the launch of the Tiangong-2, aerospace administration officials from Russia, Italy, France, German and Pakistan were invited to observe the launch in Jiuquan and have exchanges with their Chinese counterparts, according to the website of the China Manned Space Engineering Office. On several occasions, officials from China Manned Space Agency (CMSA) have said that the country is willing to provide training to others and open the future Chinese space station to foreign astronauts. 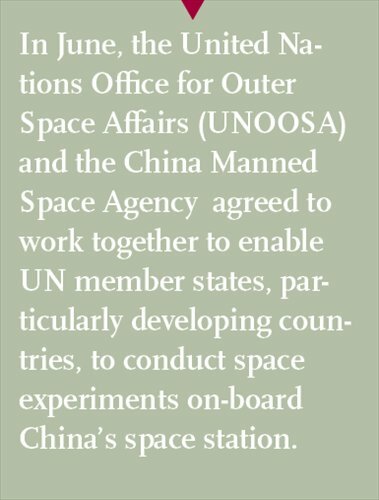 In June, the United Nations Office for Outer Space Affairs (UNOOSA) and the CMSA agreed to work together to enable UN member states, particularly developing countries, to conduct space experiments on-board China's space station, according to the UNOOSA website. When it comes to cooperation in space exploration, the US is relatively conservative but Germany is not, said German expert Braun, according to the China News Service. He mentioned that a SIM box device co-developed by Germany and China was tested on the Shenzhou-8 as early as 2011. 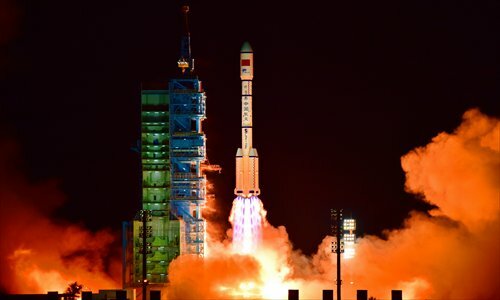 Gregory Kulacki, senior analyst and China project manager for the Global Security Program at the Union of Concerned Scientists, believes that the US's attempt to exclude China from outer space exploration has failed. Kulacki told space.com in 2013 that China's willingness and ability to provide opportunities to other countries "should make it clear that the US-led effort to isolate China in space is an outdated, ineffective and ill-conceived policy that should be changed." However, Li is pessimistic about changes, saying "The chance for the US to change their 'isolation' policy is slim as their technology is so superior and they won't seek cooperation with China unless they need it." David said he believes that politics on Earth can both stymie and stimulate space collaboration and cooperation. "Space programs of various countries can be coordinated to achieve greater goals than just one-nation, go-it-alone endeavors," he said. Still, the Chinese space technology gap with US is clear, which has already landed multiple robots on Mars and operated them for years.